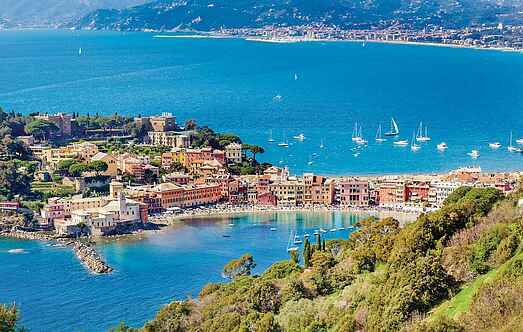 Find a vacation home to rent in Rapallo from our list of vacation rental properties. Campaya has over 24 vacation homes available in Rapallo, which give you the possibility to locate a unique accommodation in Rapallo which completes your check-list in search for the perfect self catering vacation apartments in Rapallo or vacation villas in Rapallo. Elegant attic apartment with stunning views, beautiful terrace with sea view and shared pool, just 10 minutes walk from the seafront and the beaches of Rapallo. Elegant apartment in a building with lift, with views over the Gulf of Tigullio. From the beautiful terrace of the living room you can enjoy the sun and the beautiful view of Portofino. Just 650 m from the beautiful beaches of San Michele di Pagana is this annexe of an elegant 17th-century villa. Elegant holiday apartment in an old villa in the charming coastal town of Rapallo, on the Gulf of Tigullio, only a few minutes' drive from Santa Margherita Ligure and Portofino. Pleasant holiday apartment in an old villa in the charming coastal town of Rapallo, on the Gulf of Tigullio, only a few minutes' drive from Santa Margherita Ligure and Portofino. Elegant apartment on the third floor (with lift) in an ancient villa divided in 9 apartments located in the lively town of Rapallo with tourist harbor. Bright holiday apartment a few meters from the center of Rapallo and just 1 km from the beaches of the beautiful Riviera di Levante, and just 8 km from Portofino. This nice holiday apartment is located just 300 m from the beautiful Gulf of Tigullio. It is set on the third floor and offers a nice balcony. Apartment at just 700 m from the beaches of Rapallo. The accommodation is on the mezzanine floor (short staircase) inside a building in a blind alley.